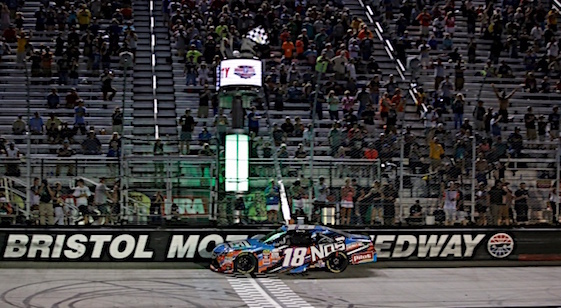 Kyle Busch set himself up for a three-series sweep at Bristol Motor Speedway when he won Friday night’s Xfinity Series event at the high-banked, half-mile oval. The win comes on the heels of Wednesday night’s Camping World Truck race and a night before he can complete the triple in Saturday’s Cup Series event. In the Truck Series race on Wednesday, Busch overcame a penalty for speeding on pit road to win. He did the same thing Friday in the Food City 300. Busch charged back from a penalty for speeding in the same segment of pit road on his first pit stop to win his ninth career Xfinity Series race at Bristol. Only one driver has completed a three-race sweep, and it was Busch in 2010 at Bristol. Contact between Jeb Burton and Brendan Gaughan with 15 laps remaining Friday injected a measure of doubt into what appeared a foregone conclusion. Busch held a comfortable lead over Joe Gibbs Racing teammate Daniel Suarez at the time of the caution and easily pulled ahead on the restart with eight laps remaining. He beat Suarez to the finish line by 1.181 seconds for his 91st career XFINITY Series victory. Busch swept each stage and led 186 total laps, including the final 81, in the No. 18 Toyota. Suarez started seventh in the No. 20 Joe Gibbs Racing Toyota and ran in the top three most of the race. In the end, he said his tires were too worn to give Busch a serious challenge. “I just didn’t take care of my tires as well as Kyle did,” Suarez said. “I didn’t have a lot to fight with right there at the end. Series points leader Elliott Sadler remains winless this season but his third place finish Friday clinched him a spot in the series’ playoff field. Sadler started eighth in the No. 1 JR Motorsports Chevrolet and led 15 laps in the final segment. (1) Kyle Busch(i), Toyota, 300. (7) Daniel Suarez(i), Toyota, 300. (8) Elliott Sadler, Chevrolet, 300. (12) Ty Dillon(i), Chevrolet, 300. (4) Justin Allgaier, Chevrolet, 300. (3) Brennan Poole, Chevrolet, 300. (16) Daniel Hemric #, Chevrolet, 300. (11) Austin Dillon(i), Chevrolet, 300. (2) Joey Logano(i), Ford, 300. (5) Cole Custer #, Ford, 300. (6) Tyler Reddick, Chevrolet, 300. (23) Michael Annett, Chevrolet, 300. (17) Dale Earnhardt Jr.(i), Chevrolet, 299. (13) Blake Koch, Chevrolet, 299. (20) Ross Chastain, Chevrolet, 299. (25) JJ Yeley, Toyota, 299. (15) Matt Tifft #, Toyota, 298. (14) Jeremy Clements, Chevrolet, 298. (24) Ben Kennedy #, Chevrolet, 297. (9) Brandon Jones, Chevrolet, 297. (34) Ray Black II, Chevrolet, 297. (19) William Byron #, Chevrolet, 297. (29) Spencer Gallagher #, Chevrolet, 296. (21) Dakoda Armstrong, Toyota, 296. (38) Brandon Brown, Chevrolet, 294. (28) BJ McLeod, Chevrolet, 291. (39) Joey Gase, Chevrolet, 290. (31) Chad Finchum, Chevrolet, 289. (22) Jeb Burton, Toyota, Accident, 281. (10) Brendan Gaughan, Chevrolet, Accident, 278. (30) Harrison Rhodes, Chevrolet, Suspension, 239. (26) Ryan Sieg, Chevrolet, 217. (33) Tommy Joe Martins, Chevrolet, Accident, 210. (35) Garrett Smithley, Chevrolet, 204. (40) Mike Harmon, Dodge, Suspension, 80. (37) Timmy Hill, Dodge, Vibration, 56. (27) Ryan Reed, Ford, Accident, 38. (18) Aric Almirola(i), Ford, Accident, 25. (32) Jeff Green, Chevrolet, Overheating, 18. (36) David Starr, Chevrolet, Accident, 11. Average Speed of Race Winner: 88.424 mph. Time of Race: 01 Hrs, 48 Mins, 30 Secs. Margin of Victory: 1.181 Seconds. Caution Flags: 8 for 46 laps. Lap Leaders: K. Busch(i) 1-16; J. Allgaier 17-32; K. Busch(i) 33-88; D. Suarez(i) 89; J. Allgaier 90-148; D. Suarez(i) 149-156; K. Busch(i) 157-172; D. Suarez(i) 173-186; E. Sadler 187-201; K. Busch(i) 202-218; D. Suarez(i) 219; K. Busch(i) 220-300. Leaders Summary (Driver, Times Lead, Laps Led): K. Busch(i) 5 times for 186 laps; J. Allgaier 2 times for 75 laps; D. Suarez(i) 4 times for 24 laps; E. Sadler 1 time for 15 laps.